Going out for donuts is a fun Saturday morning event. If my family of 5 visits our local donut shop, and each orders 1 donut, at 90 cents per donut, that's $5, including tax. Making donuts at home on a Saturday morning, is a fun activity, too. The atmosphere is festive, as we all anticipate their yummy crisp outsides, and warm, soft insides. I can make 10 donuts, 2 per person, with the following recipe, for a cost of about 5 cents a donut, or 50 cents total. Yeast donuts are actually easy to make. The dough is forgiving, and doesn't require a lot of kneading. I don't even allow them to rise fully, on the counter, before frying. My French bread recipe has more yeast in proportion to flour, than my sandwich bread. This added yeast gives a good rise to French bread, pizza crust, and donuts, without a lengthy rise time. When I use my French bread recipe for donuts, I up the sugar just a bit, to tenderize the dough and add a touch of sweetness. 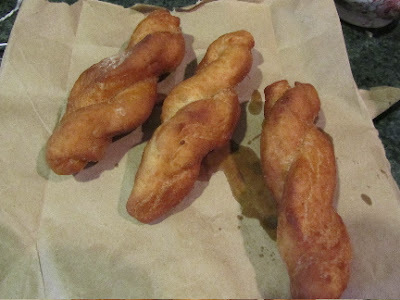 Here's how I make donut twists. 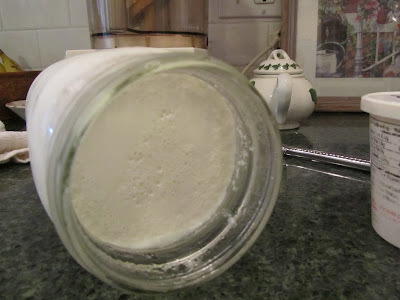 In a large bowl, soften yeast in warm water. Allow to sit 3 minutes. Stir in sugar, salt and oil. Begin mixing in flour, half at a time. After first addition of flour, beat well with a large spoon. 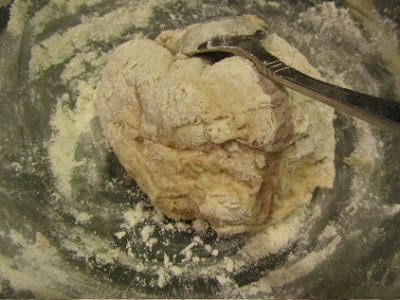 Continue mixing in flour, until you have a soft dough. Add more flour, as needed. The dough will be only very slightly sticky. 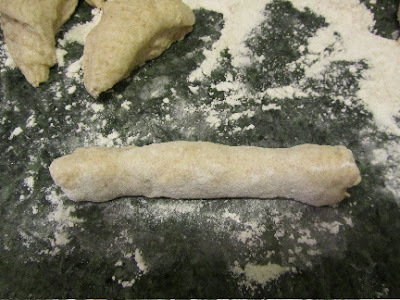 You should be able to coat the dough with a sprinkling of flour and have it stick just a little, or maybe not at all, to your hands. You don't want it so well-floured, that it is stiff and difficult to manipulate. Knead gently in the bowl, for a minute. 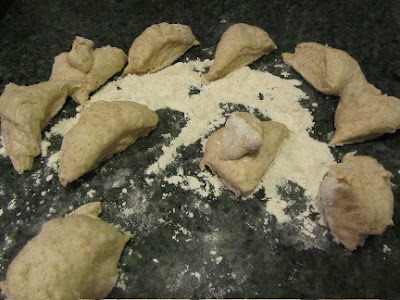 Sprinkle with a touch of flour and allow to sit for 10 minutes. Flour your counter. 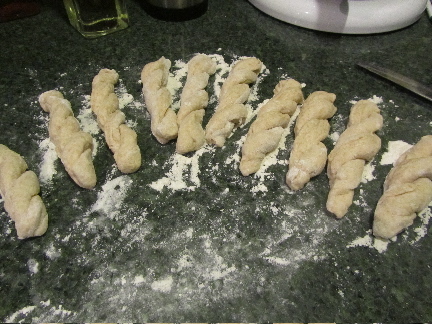 Divide dough into 10 equal pieces. Roll/form each piece into a log about 5-6 inches long. With a table knife, split this log, lengthwise, leaving 1/2-inch un-split. Twist the 2 parts of the split log, to form a twisted rope. Pinch the ends together. Set in a floured spot on your counter, to rise. Continue with the remaining pieces of dough. If you are not a perfectionist, the process goes very quickly! Allow to rise for 15 minutes. Pour about 2 to 3 inches of oil, into your frying pot. Start heating your oil, over MED heat, in a heavy-bottom stock pot, or large saucepan, to 375 degrees. If you have a candy thermometer, use that to determine temperature. Without a thermometer, you can test-fry a 1-inch cube of white bread. It will brown in 60 seconds, if your oil is around 375 degrees F.
Your donut dough will not be completely risen, like as for a loaf of bread. It will puff up in the fryer. 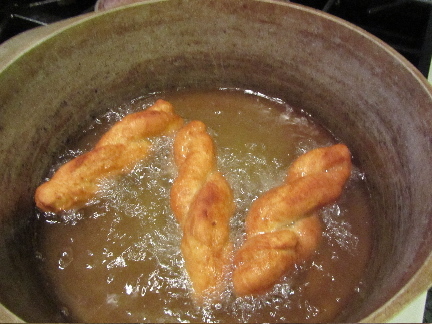 After 15 minutes of rise-time, carefully drop the twists into the hot oil. (I use my hands to lift the donut off the counter and drop into the oil, but then use a slotted spoon for turning or removing.) I fry in a stock pot, and like to fry 3 to 4 donuts at a time. 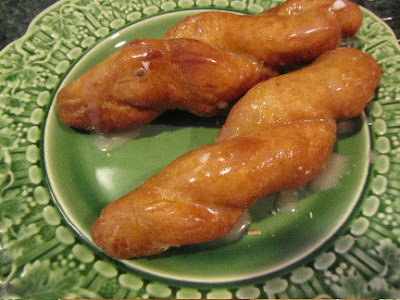 Use a slotted spoon to turn the donuts after a couple of minutes. The underside should be medium golden brown. 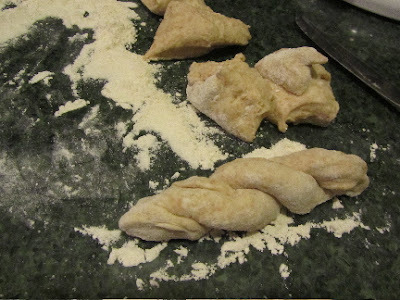 If your oil is deep enough, the twists will turn themselves, as they cook. Remove from oil and drain on paper towels or brown paper bag. Allow to drain 2 to 3 minutes. Sprinkle with cinnamon and sugar, powdered sugar, or, drizzle with a glaze. In the top photo, I had some leftover maple icing, that I thinned with milk for a maple glaze, for glazed donuts. In October, I'll be making my pumpkin-spice donuts. They are THE snack, paired with hot apple cider, after a day of raking leaves. I'll post that recipe soon. Thanks for the recipe! I'll be making these soon! Have you ever made cake donuts? I need a tried and true recipe for baked donuts. I've made deep-fried cake donuts twice, but I was not impressed with them. They soaked up too much oil. So I stick with yeast-raised ones. Do you have a "donut" cake pan? You could try baking the donuts, then dipping in melted butter (or even spraying with a non-stick spray), and rolling in cinnamon/sugar, like as for making muffin donuts (mini muffins, dipped in melted butter, then rolled in cinnamon-sugar mixture). I do have the pans. I will just play around and see what we get. Thanks! Good luck with it, Shara! Make sure to post on what recipe you like. Your donuts look so tasty. As a professional baker may I offer a pointer? 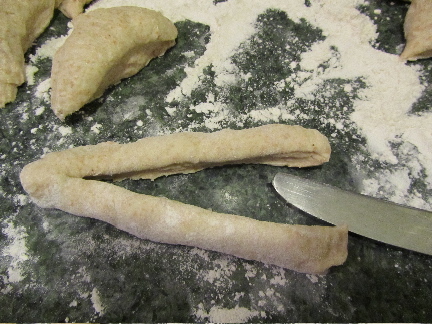 To make your “twist”: roll the log narrower and twice as long as you did here. With the palms of your hands, one on each end of the log, roll one end away from you and the other towards you. When you hands are about 10” apart (front to back) pick up the ends to let it dangle mid-air. The log will kink up in the center and twist back on itself. With experience you will get a “feel” for how much you need to twist. I hope you can follow my discription and find it helpful. Thank you so much for those "professional" tips! I'll definitely give them a try! your donuts looking wonderful! Thanks for the recipe. Thank you. Have a lovely weekend, yourself! How often do you make these on a Saturday morning? I probably make these a couple of times per month, in fall, as the weather is turning, then just maybe once per month through winter and spring. Something about autumn that makes me want home-cooked donuts! Yum, I bet they taste better than the ones from the shop too :) Are you able to eat these, or are you still off gluten? My biggest intolerance problems seem to come with store-bought items, so I can actually eat these, in small amounts. Hi Lili! I've been reading your blog religiously for a while, I initially found it looking for a solution to dividing up those giant blocks of frozen spinach--and you had done it! 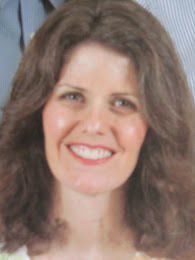 I just love your writing and all your tips and tricks. Thanks for all that you do! I was wondering what you do with the leftover oil here? I normally shy away from deep frying because it requires SO much, and even if I found a good way to store it afterwards, it would take me forever to go through using it in other ways! most of the time, I try to use as small of a pot as possible for the frying. That limits how much oil I use in the first place. Then I only add about 2 inches deep of oil. When I make the canned biscuit dough donuts, I find I can "get by" with my smallest sauce pot (about 5-6 cups volume capacity, I think?) for frying the donuts, making 2 at a time. Afterwards, depending on the time of year (I seem to deep-fry a lot more in autumn, for some reason), if I think I'll be frying again within a week or two (donuts, french fries, sweet potato fries), I just leave the oil in that pot, and keep on the back of the stove, as our house is cool enough most of the year. If I need that pot back, for general cooking, then I pour off the oil into a recycled glass jar, and refrigerate and use for cooking/deep frying. It can take as long as 3 or 4 months to use up that oil in cooking. But blended with fresh oil each time, and storing the used oil in a glass jar in the fridge, it seems to be okay enough for us. I've never had a rancid taste or off flavor with the used oil. I'll be making fried fish later this month. I know that I'll need to use up that oil quickly, and perhaps store the used oil in the freezer. We'll see how that all goes. Thanks, Lili! 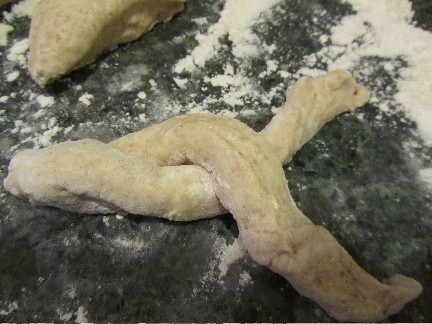 Hmm, biscuit dough. I've never made biscuits with any other fat than butter, but perhaps I could do a mix of butter and leftover oil? Alice, I've gotten lazy and make most of our biscuits as drop biscuits. I find that they turn out pretty decently, using oil, stirred in to the flour/baking powder/salt, in place of butter or shortening. Maybe my family isn't terribly picky, though. If they were used to spectacular biscuits, they might notice a big difference. I do have one recipe, though, that I use both oil and butter. Its a cheddar biscuit recipe. I stir in oil, then cut in a little butter, for flavor and richness. This post is very nice. I love to eat donuts. It is very delicious to look at. Thank you for sharing the ingredients and recipe. Hope your next recipe will published soon.